Emily, Amy and the other players, including banjo player-guitarist Alison Brown and bassist Viktor Krauss (brother of Alison Krauss), spent two weeks in Nashville recording the album, which has three original songs mixed in with classic holiday tunes. The album, tentatively titled 'Holly Happy Days,' is slated for an October release. "Amy and I have been approached about recording a holiday record before. It was unusual, because this time Amy and I both said at the same time, 'Let's do a holiday record this year,'" Emily tells The Boot. "We were both totally into it. It was a blast, really the most fun I ever had making a record." So why bluegrass for this holiday album? Although fans often think of Amy's songwriting as more rock oriented, she actually writes quite a few bluegrass tunes, says Emily. Recording a bluegrass-tinged album was something both women had wanted to do for quite a while, as both are big fans of the genre and the artistry of its players. "Alison Brown is a genius. A true genius," says Emily who lavished praise on each player's vision for the album. "When you're in the presence of that much talent, it is almost too much to take in. I looked forward to going to the studio every single day." 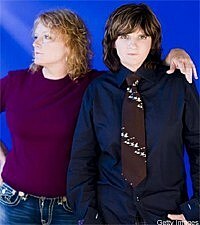 The Indigo Girls are currently part of the Lilith Fair tour and have concerts scheduled throughout the year. For a full list of cities and dates click here.